The perfect bag to carry your brand new Thump 12A or Thump 12BST. With it's heavy duty, interior and exterior, this case will protect your speaker from wear and tear, or damage that may occur when you're on the go! All Rockville pro audio cables are made with 100% copper which boosts the efficiency of the cable. There is nothing better than 100% copper. Most of the cheaper cables on the market do not use 100% copper, instead they make their cables with CCA (Copper Clad Aluminum). CCA cables do not perform on the level that 100% copper cables perform at. CCA will not conduct signals efficiently. A 12 gauge CCA cable will not even perform as well as a 14 gauge 100% pure copper cable, which will in turn, affect the performance and longevity of your equipment. If you find cables on the market that do not mention the copper content, there is a good chance that they are selling you a cheaper cable that is CCA and not 100% copper. Rockville pays an inspection company to oversee the manufacturing of the product to ensure that we provide a 100% Oxygen Free Copper Cable (OFC). Our OFC cables are less prone to oxidation, and will provide maximum signal transfer. 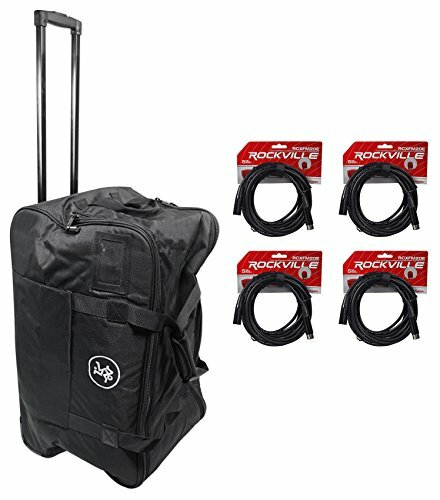 Mackie Water-Resistant Rolling Speaker Bag/Carry Case for Thump12A & Thump12BST. Bag Size (W x D x H): 25.6" x 15" x 14.5" inches. Outside cable pouch with Velcro to keep pouch closed. Business card holder on front of bag for easy accessibility. Retractable trolley handle and (2) wheels & (2) rubber feet make for easy transport when you're on the go!. 600D Polyester Fabric - makes this bag incredibly strong and durable! Outside of bag is coated with polyurethane - makes this bag water resistant. Heavy duty zippers on the outside of the bag . Comfortable webbing handles filled with dense foam on top and side of bag - makes carrying bag comfortable. (3) 20" Plastic strips on bottom of bag - prevents bag from sliding when placed on ground. Pull over flap with Velcro on top of bag - keeps bag securely closed. Lining of bag is knitted fabric with foam layer - protects your speaker from wear & tear!. The Polyethylene board on the bottom and side of the bag is covered by knitted fabric with binding at the bottom edge - Allows the speaker to stand steadily. Rockville RCXFM20E-B Black 20 Foot Nickel Plated Female to Male XLR Microphone Cable. XLR Connectors with Internal Strain Relief for Rugged Reliability. 100% Copper Conductors for Enhanced Signal Clarity. 90% OFC Spiral Shield for Effective EMI and RFI Rejection and Flexibility. Length: 20 Ft. Color: Black. If you have any questions about this product by Mack, contact us by completing and submitting the form below. If you are looking for a specif part number, please include it with your message.